Government will not be depending on natural gas use alone to solve the country’s energy woes. Rather, a mix of alternative energy sources coupled with upgrades and the use of private power producers will be utilized as the country moves forward. The disclosures were made by Minister of State, Joseph Harmon, who was yesterday delivering the feature address at the Annual General Meeting (AGM) of the Guyana Manufacturing and Services Association Limited (GMSA). At the event, held at Pegasus Hotel, Kingston, were Business Minister Dominic Gaskin and heads of several private sector bodies, along with representatives of the business community. Admitting that power outages has been a bugbear for consecutive governments, impacting time, money and resources, Harmon recognized that the country’s development is inextricably linked to reliable, cheap and sustainable power. However, he insisted the use of natural gas from the oil wells offshore Guyana which are expected to be piped in, will not be the final answers. Rather, the administration is viewing natural gas as a “transitional” arrangement. Already, to accommodate the natural gas, the Guyana Power and Light Inc. has invited tenders for a 50-megawatt natural gas-fired power plant. With natural gas not being banked on as it is not renewable, Government is looking at a mix of solar, hydro and wind, with a grid code being worked on at the moment to determine how these energy sources could eventually be connected to the national electricity grid. Government is not immune to independent power producers playing a significant role also, Harmon said, throwing out a challenge for the private sector to buy in. Already, GPL is strengthening its technical and other capabilities with smart meters and new transmission lines and transformers. Therefore, GMSA must move from a mere stakeholder to a proactive partner, the minister urged. The minister was earlier challenged by GMSA’s executive member, Ramesh Dookhoo, to tackle a major problem of dumping of foreign, inferior goods which are causing competition headaches for manufacturers. In response, Harmon disclosed that the administration has been actively addressing price fixing and dumping, along with misleading advertisement. He stressed that the effects are unfair competition. However, Government’s attempts have been rebuffed by some businesses last year, Harmon bemoaned. He said that some persons cried foul when mislabelled products were imported and passed off on Guyanese. Even though Government was castigated, it stuck to the responsibility of ensuring consumers are protected. Harmon also told the gathering of Government’s plans for the economy and green state strategy which were all designed to diversify the economy and reduce reliance on traditional areas while opening up new opportunities. According to the minister, the responsibility of charting the course cannot be only Government’s, but citizens also, including the private sector. Guyana must move to value added, from raw logs to furniture and from gold to jewellery, among other things, he said. The economy must be more than buying and selling. Harmon challenged GMSA to make use of technology and other opportunities to cut costs and remain competitive. Lauding the association for its strides, the minister pointed to an inter-ministerial round-table established to stimulate growth with major impact made in the forest sector. These include the restrictions on pinewood and money set aside from a forest inventory and stock yard. He also listed incentives for manufacturers including on green equipment, GPL rebates and institutional reforms at GRA to speed up Customs transactions. Harmon also disclosed that with climate change threats to the coastland, Government is heading to the hinterland, opening new lands to large scale agricultural projects. In mining and forestry, significant strides have been made in land reclamation and sustainable forestry management. He also spoke on the opportunities for the oil and gas industry – the proceeds of which will be used to propel other sectors of economy, particularly agriculture, public infrastructure and education. Harmon also urged the GMSA to pull out all the stops to ensure that there is a “Made in Guyana” campaign that will include better packaging and quality. 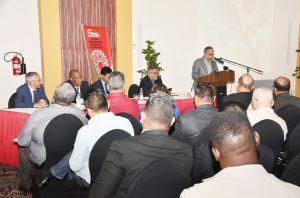 He pointed to the Trinidad and Tobago situation where oil and gas were used to develop a manufacturing industry that is one of the top in the region…almost everything is being produced there.